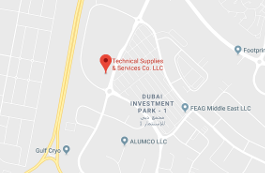 The Eutectic system from TSSC is a holdover or a latent heat storage system. The unit comprises of a 220V single phase or 380V 3 phase condensing unit coupled to eutectic plates mounted internally to the roof of the body. Externally, the system appears to be a normal over cab refrigeration unit as the condensing set is conventionally mounted above the cab of the truck. Superior Cooling and Insulation: The Eutectic System has been designed to maintain a constant temperature inside the cargo box (between -250C and -300C) irrespective of the ambient temperature. The thick polyurethane foam panels offer superior thermal insulation and the air tight-sealed panel assembly prevents any cold air loss. overnight while the vehicle is parked. This results in a substantial cost saving over the conventional expense of relying on an diesel engine. 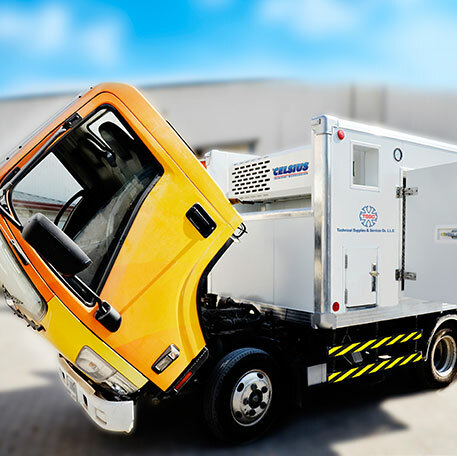 emission of harmful exhaust gases, making the vehicle an environment-friendly solution. 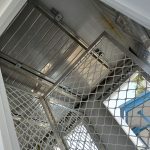 The Eutectic configuration is noise-free and guarantees uninterrupted refrigeration even in the case of system or mechanical failure or in the case of a vehicle break down. The system consists of a compressor, condenser, expansion valve, and Eutectic plates. 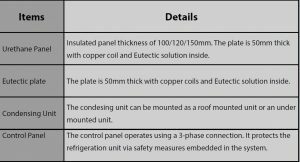 The externally mounted Condensing unit freezes the Eutectic solution(in the Eutectic plates) above and beyond the Eutectic set point (usually -330C), to about -400C. Features: Multiple side doors provide compartmentalisation for diifferent products. 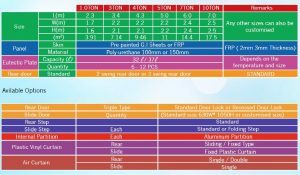 Options: 8 to 12 sides doors, Trolleys, side step, Internal Partitions. Usage: It is pertinent to deliver the frozen goods to sales stores at regular pre-determined diatances. 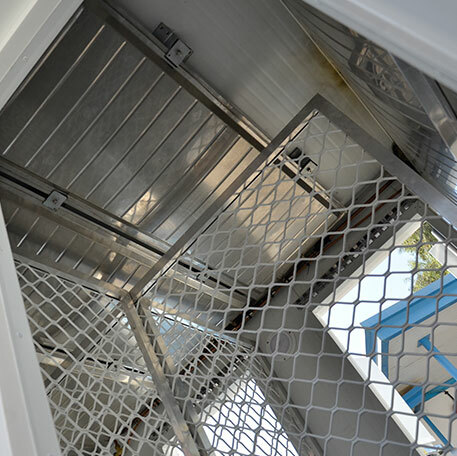 By installing internal partitions, the goods can be loaded into each chamber and protected against any damages Using side doors greatly helps enhance performance by reducing the loss of inner temperature. 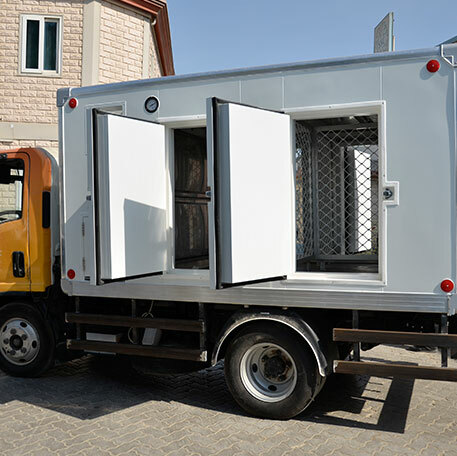 Features: By installing one side door with rear doors, it is ideal for transporting larger quantities. Usage: It is suitable to transport large quantities of frozen goods for long distances to stores or warehouses enabling the goodas to be loaded/unloaded all at once. Ideal solution to deliver frozen goods to warehouses or intermediate agencies of ice products. 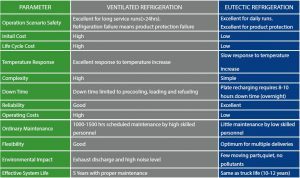 The Advantages of Eutectic Refrigeration Systems as opposed to Ventilated (blow) Systems. 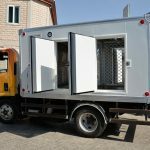 Lower energy consumption: the refrigeration unite need not be operated while travelling and nevertheless maintains an optimal internal temperature throughout the delivery shift. into the body to access the product, thus enjoys better working conditions: virtually no exposure to sudden temperature changes and evident time saving during delivery operations. Eutectic is the only refrigeration system that guarantees an optimal “cold chain” from cold storage unit to destination throughout multi-drop daily shifts, with temperature ranges between -350C and no less than -180C, as required by ATP regulations. Lower maintenance costs:operations are minimal and can be carried out by any refrigeration technician- no need for an authorised service station. No dedicated electronic board is required, therefore no electronic diagnostics devices or personnel are needed when malfunctions occur.